Do I need to put the lid on when using the spit rotisserie on my kettle barbecue? When using a rotisserie, always keep the lid on. Light a Weber Chimney Starter full of briquettes, then set the kettle up for roasting (in-direct method). The aim is to align the meat product with the central gap you have created by separating the coals. In that gap, you could put a foil drip pan with new potatoes in. These will roast beautifully with the juice created by the meat. How do you keep the temperature even on a Smokey Mountain Cooker? There are many ways to control the temperature of the Weber Smokey Mountain Cooker. The first point is to consider its positioning. If it is in an exposed area, then there will be too much oxygen fuelling the coals. You can either try restricting the bottom vents or moving the Smokey Mountain Cooker. Depending on the size use 1-1.5 Weber Chimney Starters full for a 47cm and 1.5-2 for a 57cm Smokey Mountain Cooker. You can also use the water pan to reduce temperature. Try adding cold or more water. What’s the best way to control heat on a charcoal barbecue? The best way of controlling temperature is to start with the fuel. If you are grilling, fill the Weber Chimney Starter to the top. This will create temperatures of approximately 230°C and above. For roasting, fill the Chimney Starter to three quarters full. This will create approximately 180-200°C. If you get the temperature from the fuel, then you can leave the vents open and only restrict them if the barbecue is burning too hot. Ambient weather conditions like wind, pressure and humidity can all affect how your barbecue behaves. What is the proper setting for the air vents on my kettle? Your charcoal fire needs adequate airflow to burn properly. Fully open the top and bottom vents on the barbecue while you are grilling. Close them only when you are finished grilling and ready to extinguish the flames. Remember to sift out the ashes and remove them from the ash catcher when they are cool. Is there an easy way to get the coals started? Actually there are a few tricks and any one of them will help. Use the right charcoal, the Weber’s Lighter Cubes or a Weber Chimney Starter. You can get the following accessories at your local Weber dealer or by contacting Weber’s local distributor. The lump charcoal is fast lighting with a burn time of around 60 minutes. The coal is made of beech, hornbeam, birch and oak. Ideal for cooking a wide range of meat, fish and veg. Available in 5 and 10kg. Made from carbonised wood, starch and water, the briquettes are easy to light (lit in 20 minutes with a Weber Chimney Starter). Once going they last up to three hours. They also burn at a consistent temperature making them perfect for grilling steaks or roasting joints. To light briquettes safely and with minimum hassle, try Weber lighter cubes. These solid fuel cubes light as easily as a birthday candle (even when wet!). They are odourless and non-toxic, leaving no residue to mar the flavour of your delicious grilled meal. By far the quickest and easiest method of lighting a barbecue and achieving great even heat. The Weber Chimney Starter holds the coals in a cylinder for fast, easy lighting. Fill the canister-shaped starter with the proper amount of charcoal, place on the charcoal grate over two or three fire lighter cubes, ignite the cubes and let the coals burn until you can see flames at the top of the Chimney Starter and the top layer of coals are just turning grey with ash underneath. Pour the hot coals onto the charcoal grate and arrange for Direct or In-direct cooking with long-handled tongs. For safety’s sake, wear Weber barbecue mitts. What’s the best way of smoking ribs so they don’t end up chewy? For Charcoal and Gas barbecues apply the following instructions: To achieve moist, succulent ribs cook them indirect, at a low heat for at least three hours. This will break down the tough connective tissue and make them melt in the mouth. Avoid putting on a sticky marinade on at the beginning and this can cause it to burn. Start off with a dry rub, finishing with a sticky sauce towards the end. How do I care for my cast iron cooking grates? They have rust on them. To maintain the wonderful searing/grilling performance of your cast iron grates, as well as their longevity, some special care is required. As with any cast iron cooking tool, proper seasoning is most important. First time use: Before using a cast iron grate, wash it thoroughly with a mild washing up liquid to remove the protective wax coating applied for shipping. Rinse with hot water and dry completely with a soft cloth or paper towel. NEVER ALLOW TO RINSE DRY OR WASH IN A DISHWASHER. Now season the grates to prevent rust and sticking. Gas barbecues: Preheat barbecue for 15 minutes. Place grates in barbecue. Turn burners to Medium-Off-Medium with lid closed. Allow barbecue to heat grates for 1 to 1.5 hours. Turn all burners to OFF and leave cooking grates in barbecue until they are cool. Charcoal: Arrange prepared coals for In-direct method. Place cooking grate in barbecue. Place lid on barbecue. Allow barbecue to heat grate for 1 to 1.5 hours. Close vents to extinguish coals, leaving grate in barbecue until it is cool. Your cast iron cooking grates are now ready to use. To prevent rusting, they should be re-seasoned frequently, particularly when new. If rust occurs, clean with a steel brush. Reapply vegetable shortening and heat as indicated above. Maintenance (every time you grill): Don’t do a burn-off after you grill, but rather leave the cooking residues on the grates to keep a protective coating on the cast iron. Then do a burn-off just before you grill. Brush off charred residues with a steel brush rather than a brass brush. Notes: The more you use your cast iron grates, the easier the maintenance will be. If you store your grates for extended periods of time, grease very lightly with vegetable shortening, then wipe dry with a paper towel. Store in a dry place. If rust appears, it is an indication that the grates have not been seasoned properly or enough. Or, if the burn-off method has been used after grilling, the seasoning has also been burned off. You must begin the seasoning process again, after brushing all rust away with a steel wire brush. How do I get the Charcoal to stay hot enough to cook for more than 20 minutes on my Weber kettle? Ensure that the bowl and lid vents are both fully open. Next, fill a Weber Chimney Starter with charcoal briquettes, light 2-3 lighter cubes on the charcoal grate and place the charcoal filled Weber Chimney Starter over these. Once the top layer of charcoal is just turning white with ash, pour the contents of the Weber Chimney Starter out in the desired layout, i.e. for in-direct/roasting or direct/grilling. Then place the cooking grate back on the barbecue and put the lid on. Please be aware that we would always recommend wearing protective gloves whilst handling any part of a hot barbecue or equipment. Make sure that the top and bottom air vents are open at all times during cooking. The only time you need to touch the air vents is to extinguish the briquettes after you’ve finished barbecuing. With a Weber barbecue, fresh air needs to flow constantly through the closed barbecue. For this reason, you should never raise the lid to lower the temperature. To regulate the temperature of the barbecue, do not touch the lid or the air vents – simply use fewer briquettes. This is the only method that works. And part of the charm of using briquettes is learning how to control the temperature and master the perfect barbecuing technique. I see what I think is peeling paint inside the lid of my barbecue! What should I do? Don’t worry, it is not paint. The inside surfaces of our barbecue lids are not painted. They are coated with baked-on porcelain-enamel: a glass finish which cannot peel. What you are noticing is a deposit of grease and smoke that collects during normal use. During use, the grease and smoke vapours slowly oxidises into carbon and collects on the inside of your lid. This deposit will eventually peel and looks very similar to paint. The peeling grease normally starts in the centre of the lid and spreads outward. It may come off in sheets or flakes and is shiny on one side and dull on the other. These carbon deposits are non-toxic, but you might want to regularly remove the build-up. Fortunately, the peeling is easy to remove. Simply brush off all loose particles with a brass brush or crumpled aluminium foil before you start grilling. To prevent future build-up, after every grilling session and while the barbecue lid is warm-not hot, wipe it with paper towels or a mild soap and water solution. What’s the best way to cook my Christmas Turkey on a charcoal Weber? Cooking your Christmas turkey on the barbecue is so simple and gives such juicy, delicious results! Have a look at our recipes for inspiration. It’s really straightforward and very tasty! Just cook your turkey on the barbecue for the same time as you would do in a fan-assisted oven. If it’s a large bird (takes over 4 hours), then we’d suggest adding a few more Weber Briquettes at around the 2 hour mark in order to keep the temperature even. We’d also recommend investing in a meat thermometer to ensure your food is cooked through! What should I use to clean the inside of my Genesis? To clean the grates: Heat the barbecue on full for 15-20 minutes. This will char any remaining food on the barbecue and this can easily be brushed off ready for use. To clean the Flavorizer bars: With a scraper, scrape any excess grease from the bars. These shouldn’t need any further cleaning if the barbecue is being used frequently. Ensure there is no grease build up in the bottom tray and that the drip pan is emptied before every use. Go through the burn off process above. When cooled, remove the Flavorizer bars and grates and wash using soap and water. Dry immediately and apply a small amount of cooking oil to act as a barrier against oxidising. Clean the inside of the barbecue with soap and water. If there is a carbon build up on the inside of the lid, then brush the flaking carbon off with a steel brush and clean. My Flavorizer bars need cleaning. Any tips? Maintaining your Flavorizer bars is simple and easy. Regularly doing the burn-off/brush routine should keep your Flavorizer bars clean. Start by doing a burn-off (turning all burners on high for 15 minutes with the lid closed) before or after grilling. (If you have cast iron grates, remove before burning off.) This will turn the accumulated debris on your Flavorizer bars into ashes. Then, when the grates are cool, lift them out and brush off the bars with a brass brush. If a more thorough cleaning is necessary, take the bars out of the barbecue, put them in the sink and clean with some soapy water and an abrasive pad. If using dishwashing liquid in the water, do not use anything lemon-based. Rinse thoroughly and towel dry. Do not let them drip dry, as this may cause them to rust prematurely. We do not recommend putting Flavorizer bars in the dishwasher. The amount of debris they release may cause your drain to clog. Any recommendations on how to get good crackling on pork? The best way to get crackling on pork on the barbecue is to score the rind and pour boiling water over the top. This will render some of the fat out. Add your oil and salt and cook using the in-direct method as you would normally. Make sure a drip pan is underneath to catch the fat. You could even add roast potatoes in the pan. There are many ways to control the temperature of the Weber Smokey Mountain Cooker. The first point is to consider its positioning. If it is in an exposed area, then there will be too much oxygen fuelling the coals. You can either try restricting the bottom vents or moving the Smokey Mountain Cooker. Depending on the size, use 1-1.5 Weber Chimney Starters full for a 47cm and 1.5-2 for a 57cm Smokey Mountain Cooker. You can also use the water pan to reduce temperature. Try adding cold or more water. How do I avoid flare-ups on a gas barbecue? The best way to control flare-ups is to cook with the lid down. If there is not enough oxygen, then a flare-up is unlikely to happen. It is also a good idea to obtain the colour on the food using direct heat, and then move the food to an area of in-direct heat to cook through. What is the best way to do corn on the cob on my barbecue? Rub some butter and seasoning onto the corn and either wrap it in foil or leave it in the husk. Cook it using the in-direct method for approximately 20 minutes and then remove the foil or husk and barbecue evenly on the direct heat. For the best results when smoking ribs, ensure that the Weber Smokey Mountain Cooker is between 90-120°C and leave the ribs open in the Smokey Mountain Cooker for the first 2 hours. Then baste in barbecue sauce and wrap in foil for a further one and a half hours. Finally, remove the foil and add more sticky barbecue sauce. Ribs usually take about 4-5 hours on a Weber Smokey Mountain Cooker. To achieve moist, succulent ribs, cook them indirect at a low heat for at least 3 hours. This will break down the tough connective tissue and make them melt in the mouth. Avoid putting on a sticky marinade at the beginning, as this can cause it to burn. Start off with a dry rub, finishing with a sticky sauce towards the end. Do Weber endorse the use of any fat draining system on their barbecues? Weber does not endorse the use of any fat draining system on our barbecues. Weber barbecues (charcoal, gas and electric) have been designed, tested and proven over many years to deliver great results when used properly. Always cooking with the lid down, emptying the drip pan regularly and (if required) oiling the food away from the grill should ensure trouble-free cooking without the need to use any ‘add on’ fat draining systems. We believe that real flavour comes from vaporising those fats and juices on hot coals or on our legendary Flavorizer bars. What’s the difference between Direct and In-direct Cooking? Direct cooking is simply grilling food directly over the heat source. For In-direct cooking, the heat source is placed to the side of the food and not directly under it. As a general rule, foods that take less than 25 minutes to cook, like boneless chicken breasts, pork chops and steak, are barbecued by the ‘grill’ or Direct method. Foods that require longer cooking times at lower temperatures, like whole chicken and roasts, should be barbecued by the ‘roast’ or In-direct method. You can use either method on both Weber charcoal and gas barbecues. What type of gas should I buy to use with my new Weber gas grill? Our barbecues are designed for use with Patio gas, which is sold in 5kg or 13kg Green canisters. Using another type of gas (Butane or Propane) will require a change of regulator. Changing this will result in the warranty becoming void as we cannot guarantee the user’s safety while using a third party regulator. The best way to control the flare-ups is to cook with the lid down. If there is not enough oxygen then the flare-up is unlikely to happen. It is also a good idea to obtain the colour on the food using direct heat, and then move the food to an area of in-direct heat to cook through. I think my liquid propane tank may have a leak. What should I do? Move the tank away from the house or anything combustible. Call your liquid propane dealer or the tank manufacturer and follow their recommendations on how to correct the problem. Disconnect the hose from the tank. Move the tank away form the house or anything combustible. Weber gas barbecues are designed to use liquid propane gas, which is a much more stable gas at both low and high outside temperatures than butane. If the barbecue will not light at temperatures below 0°C, check that you are using the correct propane gas for your barbecue. If you are still experiencing problems then please contact our customer service team on +852 3051 9188. A funny noise is coming from my barbecue. What should I do? Rushing noise: Immediately after turning on the gas tank valve, you may hear a “rushing” noise. This is just gas rushing into the supply hose and manifold. Groaning or metallic cracking and popping: As Flavorizer Bars, burner tubes, and cooking grates heat and cool, they expand and contract, causing these sounds. Fluttering noise: If the slide-out bottom tray is not fully pushed into place, excess air may be drawn into the cooking box, causing a “fluttering” sound. The burner tubes and Crossover ignition may also cause this sound when the lid is open and air is drawn into the cooking box from above. Finally, the flame in the Crossover ignition tube may fluctuate after ignition, which will cause a fluttering sound. Humming or whistling from the regulator: Outside temperature, humidity, barometric pressure and the gas level within the tank may cause the rubber diaphragm inside the regulator to vibrate, making a humming or whistling sound. Although this sound may be alarming, this is NOT dangerous as long as it is not accompanied by the smell of gas. Simply adjust the burner settings and usually the sound will subside. If the humming sound persists, a change in atmospheric conditions will eventually stop the vibration. My barbecue won’t light. What could be the reason? If you can light the barbecue with a match you may have an ignition switch problem. Check your igniter switch. Is it making a clicking noise? If the igniter does not click, it is not aligned correctly with the grey rocker switch. To align it, remove the control panel (consult your owner’s manual for instructions). Once the control panel is removed, check the position of the igniter. It should be tightly secured with the lock nut in the smaller hole of the keyhole frame. If the igniter is aligned properly, make sure the control panel is not loose. There should be two fasteners holding the panel in place. Next, check to see if the igniter wires are loose. The white and black wires should be secured at both ends. Then check the position of the metal tab protruding from the cooking box where the white wire attaches. This tab must be 45 degrees away from the cooking box to avoid a shorted spark. Finally, very humid or rainy weather can cause moisture to collect on the end of the probe and make the igniter unable to spark. To remedy this condition, light the barbecue with a match. The heat from the barbecue will warm the probe and should fix the problem. If you cannot light the barbecue with a match you probably have a gas flow problem. Have you cleaned your burner tubes recently? It is very important that the portholes of the burner tubes are clear of any blockage. If the gas flow is restricted, the igniter will struggle to light. To clean your tubes, brush the portholes with a steel wire brush in an up and down motion. This cleaning should be part of your routine maintenance. If you are still having problems, please contact your local Weber dealer or Weber’s head office on +852 3051 9188. To clean the grates: Heat the barbecue on full for 15-20 minutes, this will char any remaining food on the barbecue and this can easily be brushed off ready for use. To clean the Flavorizer bars: With a scraper, scrape any excess grease from the bars, these shouldn’t need any further cleaning if the barbecue is being used frequently. Go through the burn off process above, when cooled, remove the Flavorizer bars and grates and wash using soap and water. Dry immediately and apply a small amount of cooking oil to act as a barrier against oxidising. Clean the inside of the barbecue with soap and water, if there is a carbon build up on the inside of the lid then brush the flaking carbon off with a steel brush and clean. I noticed what looks like frost on my regulator. Is this normal? If your liquid propane tank has recently been filled and you notice frost on the body of the regulator, you may have an overfilled tank. Call the supplier that filled your tank and explain the situation. If they are unable to help, call your local fire department and tell them you may have an overfilled tank. Call your local Weber dealer. The regulator may have been damaged and needs to be replaced. First time use: Before using a cast iron grate, wash it thoroughly with a mild washing up liquid to remove the protective wax coating applied for shipping. Rinse with hot water and dry completely with a soft cloth or paper towel. NEVER ALLOW TO RINSE DRY, OR WASH IN A DISHWASHER. Gas barbecues: Preheat barbecue for 15 minutes; place grates in barbecue. Turn burners to Medium-Off-Medium with lid closed. Allow barbecue to heat grates for 1 to 1.5 hours. Turn all burners to OFF, and leave cooking grates in barbecue until they are cool. Charcoal: Arrange prepared coals for In-direct Method. Place cooking grate in barbecue; place lid on barbecue. Allow barbecue to heat grate for 1 to 1.5 hours. Close vents to extinguish coals, leaving grate in barbecue until it is cool. Maintaining your Flavorizer bars is simple and easy. Regularly doing the burn-off/brush routine should keep your Flavorizer bars clean. Start by doing a burn-off (turning all burners on high for 15 minutes with the lid closed) before or after grilling. (If you have cast iron grates, remove before burning off.) This will turn the accumulated debris on your Flavorizer bars into ashes. Then when the grates are cool, lift them out and brush off the bars with a brass brush. My barbecue has a fault, what do I do? If the barbecue has been purchased within the past 6 months, please contact the original retailer. If the part is not covered by the warranty, please contact customer services on +852 3051 9188 or email SupportAsia@weberstephen.com for details of how to purchase replacement parts. I bought a Weber gas / electric barbecue in a foreign country / I am thinking about taking my barbecue to a foreign country, what do I do? All Weber barbecues are manufactured and safety tested for use only in the original country of purchase. Unfortunately, Weber cannot offer parts to convert gas or electric grills which have been imported into the UK by the consumer or parts for grills intended for export to countries other than the original country of sale. The warranty is only valid in the original country of purchase, and Weber UK will not honour the warranty for any barbecues which have been imported to or exported from the UK. I have lost my owner’s manual – can I get a copy from somewhere? You can download a pdf copy of your manual here. Where can I find the serial number for my barbecue? On Charcoal grills, the serial number is two letters stamped into the lid vent. On Gas grills, the serial number will be of the format of 2 letters and several numbers eg. DE01234567. It is on a white sticker on the front of the owner’s manual, it will also be on a white sticker on the barbecue itself. On Q barbecues, the white sticker is on either the underside of one of the fold up tables, or on the back leg of the barbecue. On Spirit, Genesis and Summit barbecues, the white sticker is within the bottom cabinet of the barbecue. I have a Midi Q 220, can I use it for any of the in-direct/roasting recipes? Yes you can cook in-direct/roast on a Midi Q 220, it’s really easy! Simply pre-heat your Midi Q 220 for approximately five minutes on full. Then turn to low, place your food in the middle of the cooking grate and close the lid. Then just cook for the recommended time and always ensure your food is cooked through before serving. What’s the best way to cook on a Weber barbecue? One simple rule, keep a lid on it!! Always cook with the lid down and with the vents open. This will allow you to control the temperature more effectively, avoid flare-ups and keep food moist. With a Weber barbecue you can cook just about anything from whole chickens to cakes and breads! Try out the different barbecuing techniques – you’ll be amazed how easy they are! Get yourself started with by checking out our recipe section and using the guidelines within our simple and easy to use cooking instructions. Whatever the weather! Barbecue in the winter. Barbecue in rain and snow. Barbecue whenever and wherever you want with Weber. Weber barbecues are for life. They’re durable, practical and fun – all year round. Manufactured and tested in Chicago, they’re built to handle extreme conditions, giving you no excuse to put something on the barbecue right now! Obviously, wind can cause problems though. So, to maintain the required temperature inside the barbecue, place it in a sheltered spot – but not inside! In the winter all you’ll need is a few more briquettes to keep the temperature at its optimum. So remember to store the briquettes somewhere dry and buy a good stock so you can indulge yourself whenever the mood takes you. Light your barbecue well in advance. In colder weather the briquettes take slightly longer to heat up. Place the ignited briquettes in the barbecue, remember to open all the vents fully, put in your food, close the lid and off you go. All you need to do now is keep yourself warm round the Weber Fireplace and bingo! Barbecues have never been so much fun! Actually, there are a few tricks and any one of them will help. Use the right charcoal, the Weber’s Lighter Cubes or a Weber Chimney Starter. 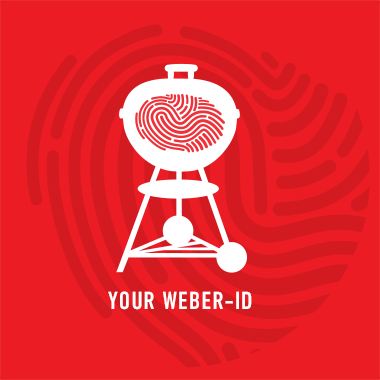 You can get the following accessories at your local Weber dealer or by contacting Weber’s local distributor. Made from carbonised wood, starch and water, the briquettes are easy to light (lit in 20 minutes with a Weber Chimney Starter). Once going, they last up to three hours. They also burn at a consistent temperature making them perfect for grilling steaks or roasting joints. To light briquettes safely and with minimum hassle, try Weber lighter cubes. These solid fuel cubes light as easily as a birthday candle (even when wet!) They are odourless and non-toxic, leaving no residue to mar the flavour of your delicious grilled meal. Ensure that the bowl and lid vents are both fully open. Next fill a Weber Chimney Starter with charcoal briquettes, light 2-3 lighter cubes on the charcoal grate and place the charcoal filled Weber Chimney starter over these. Once the top layer of charcoal is just turning white with ash, pour the contents of the Weber Chimney Starter out in the desired layout, i.e. for in-direct/roasting or direct/grilling, then place the cooking grate back on the barbecue and put the lid on. Please be aware that we would always recommend wearing protective gloves whilst handling any part of a hot barbecue or equipment. Make sure that the top and bottom air vents are open at all times during cooking. The only time you need to touch the air vents is to extinguish the briquettes after you’ve finished barbecuing. With a Weber barbecue fresh air needs to flow constantly through the closed barbecue. For this reason, you should never raise the lid to lower the temperature. To regulate the temperature of the barbecue do not touch the lid or the air vents – simply use fewer briquettes. This is the only method that works. And part of the charm of using briquettes is learning how to control the temperature and master the perfect barbecuing technique. What type of dish should I use to cook a Turkey on my barbecue? The large heavy duty foil trays sold for turkey roasts at all the supermarkets would do. They are better than the typical metal trays, as they don’t distort on the grill, so you can use these when roasting in-direct on your Weber. Roast as you usually would with seasoning, stock and root vegetables. Alternatively, if you can’t find a suitable foil tray and are cooking on a 57cm kettle, you can cook directly on the cooking grate with a drip tray underneath to catch the juices. Is it possible to fit a thermometer to a One-Touch Original? We don’t recommend fitting a thermometer to barbecues that don’t have them built in. The only way to do so would be to drill into the lid and you’d risk chipping the porcelain-enamel coating, which is what makes your Weber so weather-proof. Modifying the grill in any way would also invalidate your warranty, as we cannot authorise third party changes. Instead there is a less technical but surprisingly reliable way of checking the heat of your barbecue. It involves holding the palm of your hand over the barbecue at a safe distance above the charcoal grate. Measure the heat of the charcoal by holding you palm approximately 12cm (5 inches) above the cooking grate. If you need to pull your hand away after 2-4 seconds, the heat is high; after 5-7 seconds, the heat is medium; and after 8-10 seconds, the heat is low. Make sure you always pull your hand away from the heat before it hurts, as you don’t want to get burnt! How do I use a Weber Chimney Starter? To use a Weber Chimney Starter, remove the cooking grate from your charcoal barbecue and place the Weber Chimney Starter onto the charcoal grate. Fill the Weber Chimney Starter with Weber Briquettes and place 2 Weber Lighter Cubes onto the charcoal grate underneath the wire rack of the Weber Chimney Starter. Light the Weber Lighter Cubes. These will stay alight for around 10 – 15 mins. The way the Weber Chimney Starter works is by sucking the hot air up from the bottom and making it circulate through the briquettes. The Weber Chimney Starter will continue to do this after the Weber Lighter Cubes have gone out and should be ready within 20-30 mins. Please note that 20-30 mins is just a guideline and this can be affected either way due to weather conditions, outside temperatures and how dry your charcoal has been stored. When flames are visible at the top of the Weber Briquettes, you are ready to go. Empty the briquettes onto the charcoal grate where desired. For more information about where to position your briquettes, see cooking techniques within this section. For safety, always wear insulated barbecue mitts when doing this. Never place a Weber Chimney Starter on the grass or a wooden deck and be sure to put it on a heatproof surface away from children and pets. For an in depth look at how to do this, please see the following video. Our barbecues are designed for use with patio gas, which is sold in 5kg or 13kg green canisters. Using another type of gas (butane or propane) will require a change of regulator. Changing this will result in the warranty becoming void, as we cannot guarantee the user’s safety while using a third party regulator. For charcoal and gas barbecues, apply the following instructions: to achieve moist, succulent ribs, cook them indirect at a lot heat for at least 3 hours. This will break down the tough connective tissues and make them melt in the mouth. Avoid putting a sticky marinade on at the beginning, as this can cause it to burn. Start off with a dry rub, finishing with a sticky sauce towards the end. My gas barbecue will not light in cold weather. Weber gas barbecues are designed to use liquid propane gas, which is a much more stable gas at both low and high outside temperatures than butane. If the barbecue will not light at temperatures below 0°C, check that you are using the correct propane gas for your barbecue. If you are still experiencing problems, then please contact our customer service team on +852 3051 9188. Rushing noise: Immediately after turning on the gas tank valve, you may hear a ‘rushing’ noise. This is just gas rushing into the supply hose and manifold. Groaning or metallic cracking and popping: As Flavorizer bars, burner tubes and cooking grates heat and cool, they expand and contract, causing these sounds. Fluttering noise: If the slide-out bottom tray is not fully pushed into place, excess air may be drawn into the cooking box, causing a ‘fluttering’ sound. The burner tubes and Crossover ignition may also cause this sound when the lid is open and air is drawn into the cooking box from above. Finally, the flame in the Crossover ignition tube may fluctuate after ignition, which will cause a fluttering sound. If you can light the barbecue with a match, you may have an ignition switch problem. Check your igniter switch. Is it making a clicking noise? If the igniter does not click, it is not aligned correctly with the grey rocker switch. To align it, remove the control panel (consult your owner’s manual for instructions). Once the control panel is removed, check the position of the igniter. It should be tightly secured with the lock nut in the smaller hole of the keyhole frame. If the igniter is aligned properly, make sure the control panel is not loose. There should be two fasteners holding the panel in place. If you cannot light the barbecue with a match, you probably have a gas flow problem. Have you cleaned your burner tubes recently? It is very important that the portholes of the burner tubes are clear of any blockage. If the gas flow is restricted, the igniter will struggle to light. To clean your tubes, brush the portholes with a steel wire brush in an up and down motion. This cleaning should be part of your routine maintenance. If you are still having problems, please contact your local Weber dealer or Weber head office on +852 3051 9188. Serial numbers on pre-2013 charcoal barbecues are the 2 letters engraved on the lid vent. From 2013, this will be 2 letters followed by a series of numbers engraved on the lid vent. Serial numbers on gas grills contain 2 letters followed by a series of numbers. This can be found in the front of owner's manual or on a white sticker on the frame of the barbecue. Serial numbers on Q grills can be found on the white sticker on the back leg of the barbecue or under the table.